14K White Gold Comfort Fit 2.5mm Milgrain Edge Ring - 14K white gold, 2.5 mm wide heavy comfort fit, milgrain edge wedding band. The finish on the ring is polished. Other finishes may be selected or specified. 14K Rose Gold 6mm Milgrain Comfort Fit Wedding Band - 14 kt Rose gold, 6.0 mm wide heavy comfort fit, milgrain edge wedding band. The finish on the ring is polished. Other finishes may be selected or specified. 14K Gold 6mm Milgrain Comfort Fit Wedding Band - 14 kt yellow gold, 6.0 mm wide heavy comfort fit, milgrain edge wedding band. The finish on the ring is polished. Other finishes may be selected or specified. 18K Gold 5mm Milgrain Comfort Fit Wedding Band - 18kt white gold, 5.0 mm wide heavy comfort fit, milgrain edge wedding band. The finish on the ring is polished. Other finishes may be selected or specified. 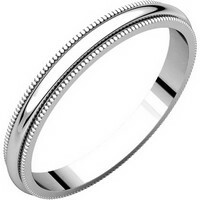 Palladium 5mm Milgrain Edge Comfort Fit Wedding Band - Palladium, 5.0 mm wide heavy comfort fit, milgrain edge wedding band. The finish on the ring is polished. Other finishes may be selected or specified. 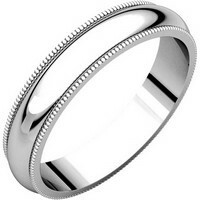 Platinum 6mm Milgrain Comfort Fit Wedding Band - Platinum, 6.0 mm wide heavy comfort fit, milgrain edge wedding band. The finish on the ring is polished. Other finishes may be selected or specified. 14K Gold 6mm Milgrain Comfort Fit Wedding Band - 14kt white gold, 6.0 mm wide heavy comfort fit, milgrain edge wedding band. The finish on the ring is polished. Other finishes may be selected or specified. 18K Rose Gold 8mm Milgrain Comfort Fit Wedding Band - 18 kt Rose gold, 8.0 mm wide heavy comfort fit, milgrain edge wedding band. The finish on the ring is polished. Other finishes may be selected or specified. 18K Rose Gold 6mm Milgrain Comfort Fit Wedding Band - 18 kt Rose gold, 6.0 mm wide heavy comfort fit, milgrain edge wedding band. The finish on the ring is polished. Other finishes may be selected or specified. 18K Rose Gold 5mm Milgrain Comfort Fit Wedding Band - 18K Roset gold, 5.0 mm wide heavy comfort fit, milgrain edge wedding band. The finish on the ring is polished. Other finishes may be selected or specified. 14K Rose Gold 3mm Comfort Fit Milgrain Wedding Band - 14K Rose gold, 3.0 mm wide, heavy comfort fit, milgrain edge wedding band. The finish on the ring is polished. Other finishes may be selected or specified. 14K Rose Gold 4mm Milgrain Edge Comfort Fit Wedding Band - 14K Rose gold, 4.0 mm wide heavy comfort fit, milgrain edge wedding band. The finish on the ring is polished. Other finishes may be selected or specified. 14K Gold 4mm Milgrain Edge Comfort Fit Wedding Band - 14k yellow gold, 4.0 mm wide heavy comfort fit, milgrain edge wedding band. The finish on the ring is polished. Other finishes may be selected or specified. 14K White Gold Milgrain Edge Comfort Fit Wedding Band - 14k white gold, 4.0 mm wide heavy comfort fit, milgrain edge wedding band. The finish on the ring is polished. Other finishes may be selected or specified. 18K Gold 4mm Milgrain Comfort Fit Wedding Band - 18k white gold, 4.0 mm wide heavy comfort fit, milgrain edge wedding band. The finish on the ring is polished. Other finishes may be selected or specified. Palladium 4mm Milgrain Comfort Fit Wedding Band - Palladium, 4.0 mm wide heavy comfort fit, milgrain edge wedding band. The finish on the ring is polished. Other finishes may be selected or specified. Platinum 4mm Milgrain Comfort Fit Wedding Band - Platinum, 4.0 mm wide heavy comfort fit, milgrain edge wedding band. The finish on the ring is polished. Other finishes may be selected or specified. 18K Gold 8mm Milgrain Comfort Fit Wedding Band - 18 kt white gold 8.0 mm wide heavy comfort fit, milgrain edge wedding band. The finish on the ring is polished. Other finishes may be selected or specified. 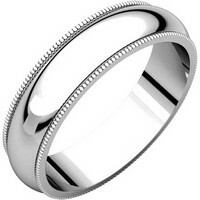 Palladium Milgrain Comfort Fit Wedding Band - Palladium, 8.0 mm wide heavy comfort fit, milgrain edge wedding band. The finish on the ring is polished. Other finishes may be selected or specified. Platinum Milgrain Edge Comfort Fit Band - Platinum, 8.0 mm wide heavy comfort fit, milgrain edge wedding band. The finish on the ring is polished. Other finishes may be selected or specified. 14K Gold 3mm Comfort Fit Milgrain Wedding Band - 14k yellow gold, 3.0 mm wide, heavy comfort fit, milgrain edge wedding band. The finish on the ring is polished. Other finishes may be selected or specified. Palladium 3mm Wide Comfort Fit Milgrain Wedding Band - Palladium, 3.0 mm wide, heavy comfort fit, milgrain edge wedding band. The finish on the ring is polished. Other finishes may be selected or specified. 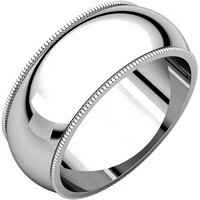 Platinum, 3mm Comfort Fit Milgrain Wedding Band - Platinum, 3.0 mm wide, heavy comfort fit, milgrain edge wedding band. The finish on the ring is polished. Other finishes may be selected or specified. Platinum Comfort Fit 2.5mm Milgrain Edge Ring - Platinum, 2.5 mm wide heavy comfort fit, milgrain edge wedding band. The finish on the ring is polished. Other finishes may be selected or specified. 18K Gold 3mm Comfort Fit Milgrain Wedding Band - 18k white gold, 3.0 mm wide, heavy comfort fit, milgrain edge wedding band. The finish on the ring is polished. Other finishes may be selected or specified. 14K Gold 3mm Comfort Fit Milgrain Wedding Band - 14k white gold, 3.0 mm wide, heavy comfort fit, milgrain edge wedding band. The finish on the ring is polished. Other finishes may be selected or specified. 18K White Gold Milgrain Edge, 2.5mm Wedding Ring - 18K white gold, 2.5 mm wide heavy comfort fit, milgrain edge wedding band. The finish on the ring is polished. Other finishes may be selected or specified. 18K Gold Comfort Fit 2.5mm Milgrain Edge Ring - 18K yellow gold, 2.5 mm wide heavy comfort fit, milgrain edge wedding band. The finish on the ring is polished. Other finishes may be selected or specified. 14K Gold 5mm Milgrain Comfort Fit Wedding Band - 14kt Yellow gold, 5.0 mm wide heavy comfort fit, milgrain edge wedding band. The finish on the ring is polished. Other finishes may be selected or specified. 14K Gold 5mm Milgrain Comfort Fit Wedding Band - 14kt white gold, 5.0 mm wide heavy comfort fit, milgrain edge wedding band. The finish on the ring is polished. Other finishes may be selected or specified. 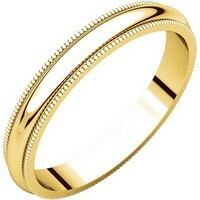 18K Gold 4mm Milgrain Comfort Fit Wedding Band - 18k yellow gold, 4.0 mm wide heavy comfort fit, milgrain edge wedding band. The finish on the ring is polished. Other finishes may be selected or specified. 18K Rose Gold 4mm Milgrain Comfort Fit Wedding Band - 18K Rose gold, 4.0 mm wide heavy comfort fit, milgrain edge wedding band. The finish on the ring is polished. Other finishes may be selected or specified. 14K Rose Gold 5mm Milgrain Comfort Fit Wedding Band - 14K Roset gold, 5.0 mm wide heavy comfort fit, milgrain edge wedding band. The finish on the ring is polished. Other finishes may be selected or specified. 18K Rose Gold Comfort Fit 2.5mm Milgrain Edge Ring - 18K Rose gold, 2.5 mm wide heavy comfort fit, milgrain edge wedding band. The finish on the ring is polished. Other finishes may be selected or specified. 14K Gold Comfort Fit 2.5mm Milgrain Edge Ring - 14K yellow gold, 2.5 mm wide heavy comfort fit, milgrain edge wedding band. The finish on the ring is polished. Other finishes may be selected or specified. 14K Rose Gold Comfort Fit 2.5mm Milgrain Edge Ring - 14K Rose gold, 2.5 mm wide heavy comfort fit, milgrain edge wedding band. The finish on the ring is polished. Other finishes may be selected or specified. 14K Rose Gold 8mm Milgrain Comfort Fit Wedding Band - 14 kt Rose gold, 8.0 mm wide heavy comfort fit, milgrain edge wedding band. The finish on the ring is polished. Other finishes may be selected or specified. 18K Gold 6mm Milgrain Comfort Fit Wedding Band - 18 kt white gold, 6.0 mm wide heavy comfort fit, milgrain edge wedding band. The finish on the ring is polished. Other finishes may be selected or specified. Palladium 6mm Milgrain Comfort Fit Band - Palladium, 6.0 mm wide heavy comfort fit, milgrain edge wedding band. The finish on the ring is polished. Other finishes may be selected or specified. 14K Gold 8mm Milgrain Comfort Fit Wedding Band - 14 kt yellow gold, 8.0 mm wide heavy comfort fit, milgrain edge wedding band. The finish on the ring is polished. Other finishes may be selected or specified. Platinum 5mm Milgrain Edge Comfort Fit Wedding Band - Platinum, 5.0 mm wide heavy comfort fit, milgrain edge wedding band. The finish on the ring is polished. Other finishes may be selected or specified. 14K Gold 8mm Milgrain Comfort Fit Wedding Band - 14 kt white gold, 8.0 mm wide heavy comfort fit, milgrain edge wedding band. The finish on the ring is polished. Other finishes may be selected or specified. 18K Rose Gold 3mm Comfort Fit Milgrain Wedding Band - 18K Rose gold, 3.0 mm wide, heavy comfort fit, milgrain edge wedding band. The finish on the ring is polished. Other finishes may be selected or specified. Palladium Comfort Fit 2.5mm Milgrain Edge Wedding Ring - Palladium, 2.5 mm wide heavy comfort fit, milgrain edge wedding band. The finish on the ring is polished. Other finishes may be selected or specified. 18K Gold 3mm Comfort Fit Milgrain Wedding Band - 18k yellow gold, 3.0 mm wide, heavy comfort fit, milgrain edge wedding band. The finish on the ring is polished. Other finishes may be selected or specified. 14K Gold 10mm Milgrain Comfort Fit Wedding Band - 14 kt yellow gold 10.0mm wide heavy comfort fit, milgrain edge wedding band. The finish on the ring is polished. Other finishes may be selected or specified. 14K White Gold 10mm Milgrain Comfort Fit Wedding Band - 14kt white gold 10.0 mm wide heavy comfort fit, milgrain edge wedding band. The finish on the ring is polished. Other finishes may be selected or specified. 18K Gold 10mm Milgrain Comfort Fit Wedding Band - 18K yellow gold 10.0mm wide heavy comfort fit milgrain edge wedding band. The finish on the ring is polished. Other finishes may be selected or specified. 18K Gold 10mm Milgrain Comfort Fit Wedding Band - 18Kt white gold 10.0mm wide heavy comfort fit, milgrain edge wedding band. The finish on the ring is polished. Other finishes may be selected or specified. 14K Rose Gold 10mm Milgrain Comfort Fit Wedding Band - 14 kt Rose gold 10.0mm wide heavy comfort fit, milgrain edge wedding band. The finish on the ring is polished. Other finishes may be selected or specified. 18K Rose Gold 10mm Milgrain Comfort Fit Wedding Band - 18K Rose gold 10.0mm wide heavy comfort fit milgrain edge wedding band. The finish on the ring is polished. Other finishes may be selected or specified.